YHA Manchester i Manchester, England: Reservér nu! Just 10 minutes’ walk from central Manchester, the YHA hostel boasts a café bar, regular film nights in its cinema room, a canal side restaurant, and free parking (subject to availability). With a 24-hour front desk, the property provides a lovely buffet breakfast each morning for just £6.25 and free Wi-Fi in public areas. 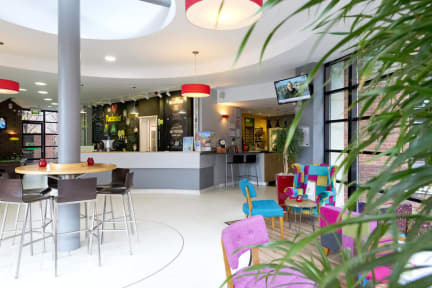 Guests at YHA Manchester can make use of a communal kitchen to store food and cook meals. All rooms contain bunk beds and are en-suite. Laundry facilities are provided for guests’ use, and there is 24-hour guest access to the hostel. Deansgate Railway Station is less than 10 minutes’ walk away, whilst the MEN Arena is just a mile away. A number of bars and restaurants can be reached with a 10-minute walk and the city centre is just 15-20 minutes walk or why not make use of the city's free bus network.